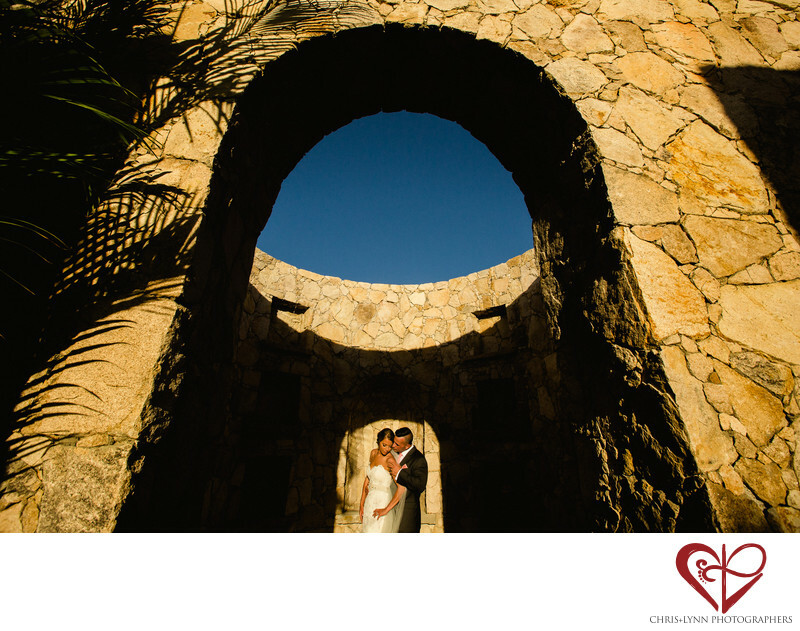 Esperanza is one of our favorite wedding venues in Los Cabos for wedding photography. Few resorts can match Esperanza's luxe yet contemporary room decor, cascading stone dining terraces overlooking the Sea of Cortez, and stunning views toward Cabo's famous El Arco. We've been so fortunate to have photographed dozens of weddings at Esperanza over the years. The property has so many special places to shoot, all within a manageable area when you have a skilled and speedy golf cart driver! As artists, we are always looking for different perspectives in a familiar location and new takes on a conventional shot. Though we have shot at Esperanza many times, it always inspires us! As do our couples. This bride and groom were so open and trusting of us to be creative & try something different. The dramatic, almost harsh shadows contrasted with their soft & intimate moment makes this portrait one of our favorites. Wedding portraiture is really a collaboration between photographers and couples.This luxury Los Cabos wedding was selected as a featured real wedding by Perfect Wedding Magazine and was also published on the Carats & Cake blog. 1/800; f/11.0; ISO 400; 16.0 mm.